I never thought I would say this, but I think Dubai needs more Masterbakers. This is in no way throwing shade at the existing Masterbakers, but as a craft, it has not evolved in Dubai as much as it has across the globe. Also, there are some excellent Masterbakers in some of the 5-star hotels, but they often play a supporting role in banquets, buffets and room service. The Serb woke up wishing there was a local bakery serving fresh, warm baked goods, straight from the oven that we could have breakfast at. By local, I think she literally meant downstairs in our kitchen as she seemed disappointed that we would have to leave the house. With everyone distracted by the newly opened La Mer, I thought a quick trip to JBR’s Beach might be a quiet, pleasant way to spend a weekend morning. Pleasant, it was, quiet it was not. Dubai has a habit of stuffing more and more retail projects into densely populated areas of Dubai, and the Marina is no exception. The new harbour construction is well underway, and with the tram, traffic and small diversions, it turns a quick trip for a relaxing breakfast into a road trip that almost requires overnight provisions and an extended mixtape playlist. 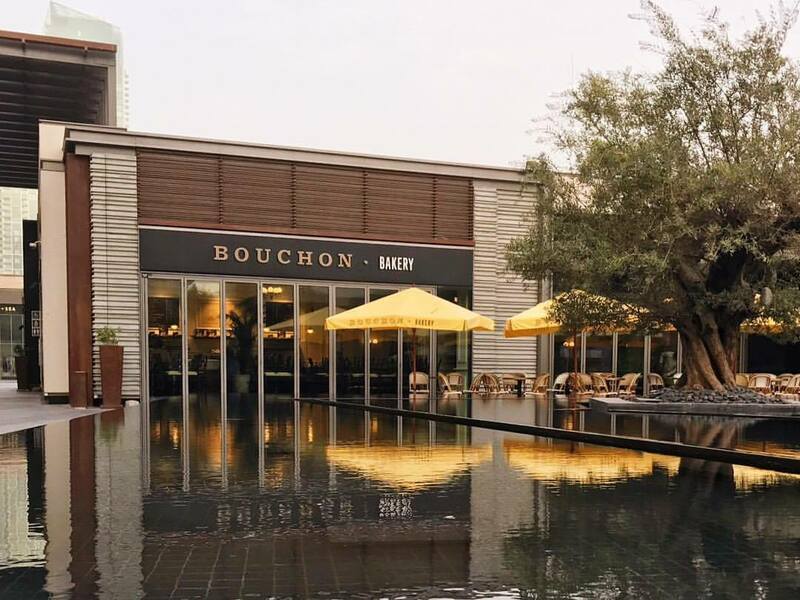 I know Bouchon Bakery has been open for a while, but the concept intrigues me because it is a partnership between Chef Thomas Keller, whose US restaurants have 7 Michelin Stars between them and Alshaya of Starbucks and Shake Shack franchise fame. Bouchon Bakery has taken over the old Paradis Du Fruit location on The Beach Walk. If you had never heard of it, you weren’t alone. It made barely a ripple when it was open and closed just as quietly, unfortunately. 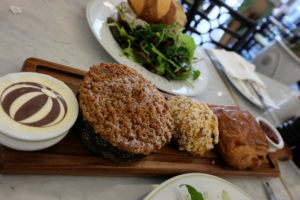 Bouchon Bakery has taken the space and utilized a light, Parisian inspired décor to pleasing effect. There is a homely, whimsical and nostalgic feel to the place, without being overly forced or manufactured. Quite an achievement for Alshaya, which I sometimes feel is a real estate company first and a retailer second. The indoor palm trees added a hint of the exotic, and the traditional booths, globe lights, and brass detailing balanced the space out. 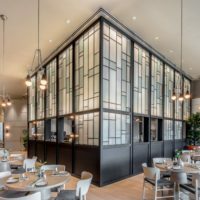 The bakery’s accordion doors were open, allowing the indoors outdoors, the Gulf’s cool morning air bringing a subtle Californication to the whole experience. 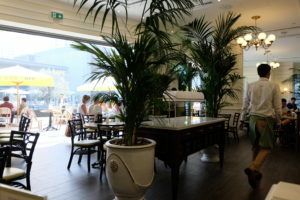 The bakery choices are unfortunately a little bit too familiar, but that is to be expected as Bouchon was created in the image of the famous traditional boulangeries of France. Viennoiserie such as strawberry croissants and pain au chocolate, almond croissants and blueberry muffins are also familiar mainstays of other bakeries across Dubai as well. However, where Keller hints at some creativity is to give space to some lessor known bakes, such as Monkey Bread, Streusel Cake, and Cheese Danish. I’ve watched enough GBBO to know that climate and humidity can greatly affect the consistency and quality of the bake and I’ve heard Dubai’s kitchens are notoriously difficult to work in when it comes to proving, rising and baking. The Serb wanted the BLTE, and so did I. I said we couldn’t order the same thing, especially if we are doing a review. 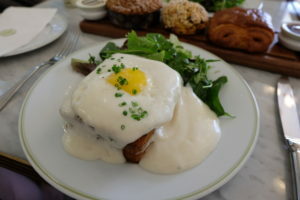 So, after a brief discussion, I magnanimously changed my order to the Croque Madame. Having won that standoff, the Serb then changed her order to the chicken salad pretzel sandwich. I also ordered three pastries as well. For research purposes of course. Pain du chocolat for direct market comparison, a lemon currant scone, and streusel cake to test the skills of the kitchen. Call me Mr. Hollywood. 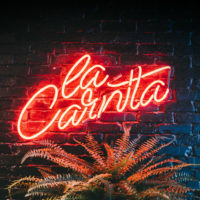 Service was satisfactory, but I almost forgot to even mention it, such was the perfunctory nature of the overall engagement of the staff. That’s the big question, can a huge franchisor pull off “local community” service? Answers on a postcard. The Croque Madam – two slabs of brioche with slivers of turkey ham and cheese, topped with a fried egg and drowned with sauce Mornay. Sauce Mornay is a béchamel sauce with cheese added. Some argue that extra egg yolks and mustard seed should be included, and I feel this dish would have benefited from that particular recipe. The sauce was quite thin, pale and very mild in flavour. I missed the gentle punch that a cheese like Gruyère should have provided. If a cheese was in the sauce, I missed it. I would also mention that the brioche was probably a 1/8 of an inch too thick, but I won’t because I don’t want to nitpick. The Serb’s pretzel chicken sandwich arrived, and she announced that pretzel bread is her most favourite bread ever. I wanted to mention that this was the first time I’ve ever seen her eat pretzel bread in my life. Instead, I just nodded encouragingly and popped a piece of brioche into my mouth, thankful for its thickness. However, the pretzel bread was excellent – the softness of the bake, the chew of the crust, the sweet-salty flavour all came together. The roast chicken filling was mixed with cranberries and pecans in a yogurt dressing. A really pleasant sandwich. The three pastries arrive on a wooden board topped and tailed by small pots of butter and jam. Their quality was undeniable. The chocolate in the pain au chocolat was generous and premium, elevating this staple croissant to the higher echelons of Viennoiseries. The winner for me was the lemon currant scone – a tangy sweet scone that was firm, yet broke away into satisfying chunks, ready to be generously smeared with lightly salted soft butter. It was buttery and soft, with small nuggets of chewy currants interspersed throughout and a freshness that only lemons can bring. I could have eaten eight more. The streusel cake was also surprisingly good – less sweet than it’s associates, quite delicate with a subtle layer of cocoa running through it like a geographical fault line. It also tasted great smeared with butter, but then again, most things do. As for the coffee, perhaps go elsewhere – it’s not their strength. 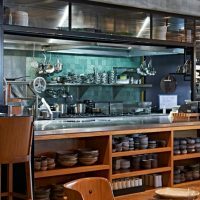 Chef Keller has left some excellent recipes with the kitchen team here in Dubai, and several months in, they are still executing it very well. I think Bouchon Bakery has gone a long way to filling that gap of good quality European style bakeries and I look forward to them providing a good alternative to Paul’s in a few more locations. However, can they fit into that local micro-community space? I’m not so sure. Having said that, I wouldn’t mind if there was a box of lemon currant scones in my kitchen every morning, and we all know how much The Serb loves pretzel bread. It’s her favourite apparently.